As I plough through this post do spare a thought for my waistline, all this dining out is so bad for it. The belt hooks available to me are getting fewer and the skinny jeans I’ve been wearing are getting ever more tight and ever more unsightly. But still I eat on… Feeling sorry for me yet? I had been to Bone Daddies for lunch, but being the greedy piglet that I am couldn’t resist Meat Liquor for dinner as I’ve not been there before and anyone who’s anyone has been there! We queued up – yes queued up at 6pm and eventually got to the bar and then to our table. We decided a couple of cocktails and a bottle of Sauvignon Blanc should set us up right for the evening, well another glass of wine on top of that after our food, oh and possibly another cocktail – but who’s counting. I wasn’t particularly hungry but once we got stuck into reading the menu we went for a cheeseburger and a bacon cheeseburger, fries (specifically fries, not chips), deep fried pickles and Bingo Wings. It all arrives on one big tray and you dig in. Napkins in the form of a roll of E.A.W. It was so good. The burger tasted scrummy, it was a little dense for me, but I think that may have had something to do with me overindulging on lunch, fries and wings. 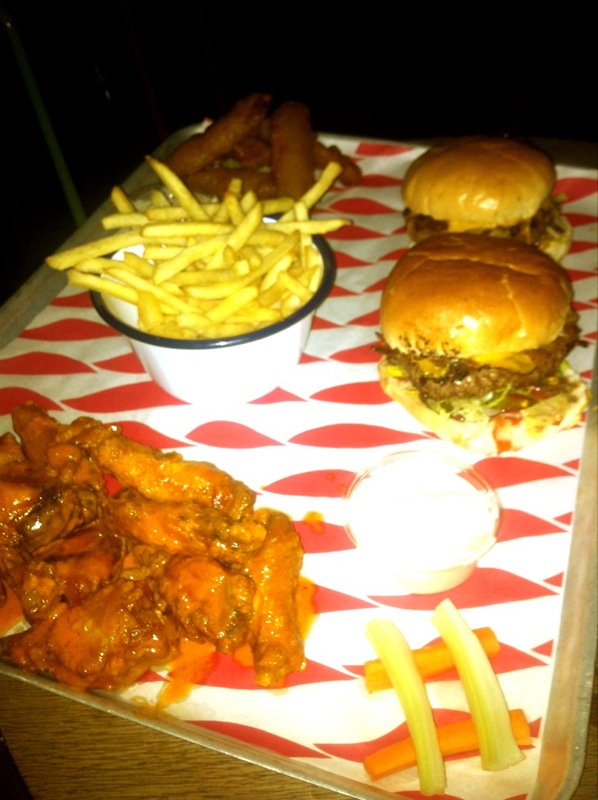 If you haven’t tried a bingo wing from Meat Liquor – you must. They are slightly spicy, gorgeously messy, slightly vinegary (I mean that in a good way) it’s got that flavour that makes you want more and more, which is, I imagine why the portions of wings are about 20 strong! Very loud music, really good food, good value wines and a fantastic atmosphere. meat Liquor, in my opinion is a perfect start to a big night or a massive weekend.